In this outing he is confronted by several high-profile cases including the theft of a valuable diamond necklace, the death of a well-known actor which is reported as suicide until the actor’s girlfriend claims it was murder and the vicious beating of a young Indian woman. Heineken and his team, DC Faye Addison and DS Rafe Tredway, think they know which of the island’s criminal fraternity is responsible for the necklace theft but they have a devil of a time proving it as their prime suspect has claimed police harassment before so they must read very carefully indeed. The investigation into the actor’s death meanwhile introduces the police to an entirely. 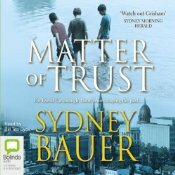 Review summary: The book makes excellent use of the first-person point of view by showing us both the public face and private thoughts of its protagonist. It also has a really topical and clever mystery element in addition to its great sense of humour and deliciously off-beat characters. A delight to read. Synopsis: Jodie, Hannah, Louise and Corinne plan a relaxing weekend away without their kids or husbands. Jodie has chosen a newly renovated barn in the country town of Bald Hill, a short drive from Newcastle where the women all live, for the annual getaway. The weekend starts to go wrong when the women have a minor car accident on their drive to the barn, though this does provide the opportunity for them to meet Matt Wiseman, working at his father’s garage while recovering from injuries received in his job as a policeman. Though they do manage to squeeze in some some of the champagne-drinking and chocolate-eating they planned, the weekend turns very grim for the four friends when two men turn up at the barn and won’t leave. 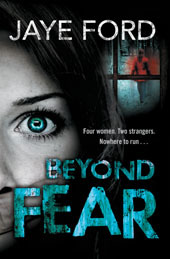 Review summary: A debut novel by a former journalist, Beyond Fear is a fast-paced psychological thriller and an easy read that I gobbled up in a single sitting. The strong female characters are a highlight, though I did think the first half of this one was stronger than the second. Synopsis: Paramedics are called to a domestic disturbance at the suburban home of Suzanne and Connor Crawford one night only to have the couple explain the incident away as nothing more than a disagreement. The next evening Police and paramedics are again called to the address only this time Suzanne Crawford is dead and her husband is missing. Detective Ella Marconi and her partner start to focus on the missing husband as a suspect in his wife’s murder. They are hampered by not being able to discover much about the husband’s past and then then learn about some bizarre behaviour that Suzanne was engaging in prior to her death. Although a very focussed policewoman, usually to the detriment of her personal relationships, Ella is troubled here by her father’s health problems and there’s also a minor but thought-provoking thread involving the paramedics who were called to the Crawford house on the night of the murder. 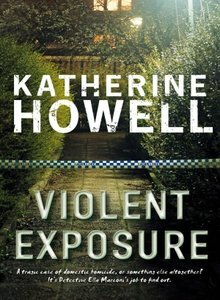 Review summary: In my view Katherine Howell has risen to the upper echelons of crime writing story tellers, having now produced four very accomplished tales which just keep getting better. Here she manages the multiple plot threads expertly and creates credible suspense out of the lives of average people and throws in a moral conundrum or two. Synopsis: In his youth Boston-based lawyer David Cavanagh had two best friends, Chris Kincaid and Mike Murphy, though he hasn’t kept in close contact with either. However there is a shared history that binds the three together and when Chris is arrested for the murder of a woman they all knew, David can’t help but go home to Newark, New Jersey to help. Deeply buried family secrets need to be investigated before there’s even a glimmer of hope that Kincaid can be successfully defended. Review summary: A fairly standard legal procedural/thriller that had a little too much of a TV sensibility for me to be fully engaged with it, though the story did have a decent pace and the complex plot was logical even if it was a bit predictable and tended towards the soap opera at the end. Synopsis: A dead man falls from the sky and lands at the feet of Nicolas son of Sophroniscus the sculptor one Athens morning in 461AD. The body is that of Ephialtes, creator of the world’s first, and still fledgling, democracy and his death could mean civil war. In the absence of a family member to do the job Pericles, a politician and fellow supporter of the move towards democracy, commissions Nicolas to investigate Ephialtes’ death with the hopes of quickly being able to discover the responsible party and bring them to justice. Of course the most obvious suspects are those old-guard politicians who weren’t to keen on handing political power over to the people, so Nicolas is literally putting his life at risk by taking on the job. However he’s young and idealistic and also sees it as the perfect opportunity to get a foothold in politics himself which would mean he doesn’t have to follow in his father’s profession. 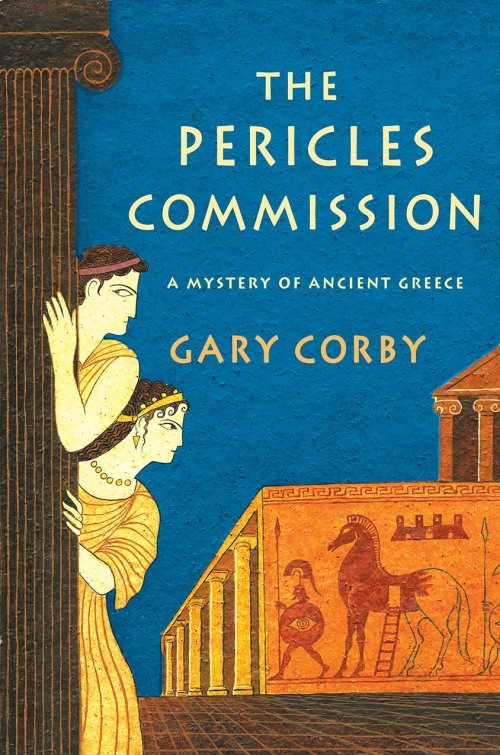 Review summary: Corby has woven and intriguing and plausible fictional tale around the real events of the time in this debut historical mystery. The engaging young hero and humour of the book are definite highlights of the book. 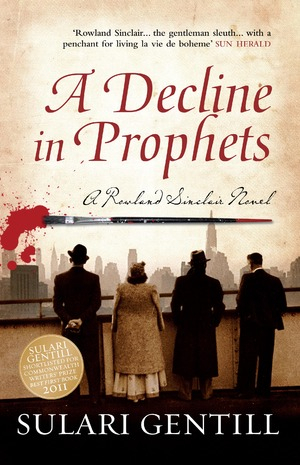 Synopsis: It’s 1932 and the luxury ocean liner RMS Aquitania is making its way to Australia with Rowland ‘Rowly’ Sinclair and his travelling companions on board. Their fellow passengers include an octogenarian political activist and former head of the Theosophist movement, several other members of the movement, a Catholic Bishop and a couple of priests. When there is a grim murder on board Rowly is at the centre of things, mostly because he’s a bit too polite for his own good. The boat stops in New York before making landfall in Australia but things go from bad to worse for Rowly and his friends and at one point it looks like poor Rowly will hardly be considered a suitable godfather for his newest nephew. Review summary: Highlights of this book include thoughtfully drawn characters, a gentle but clever humour, fantastic insight into the period and a real Australian feel to it. A very satisfying read for me and one I would recommend widely. I’m trying to read as many books as I can that are either nominated for this year’s Ned Kelly Awards (best Australian crime fiction) or are eligible for this year’s Davitt Awards (I can vote in the Reader’s choice category of the awards for crime writing by Australian women) so there will hopefully be lots more Aussie books to come in the next few weeks. This entry was posted in David Owen (Aus), Gary Corby (Aus), Jaye Ford (Aus), Katherine Howell (Aus), mini review, Sulari Gentill (Aus), Sydney Bauer (Aus). Bookmark the permalink. Great list of books. I’ll add some to the intimidating TBR list, and hope come to my library, Book Depository or Amazon US. 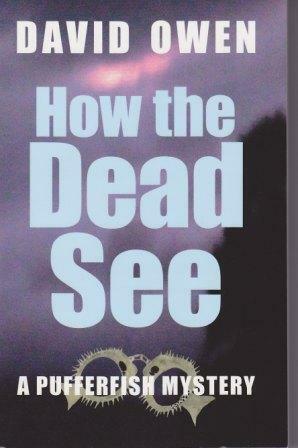 The books by Katherine Howell and Sulari Gentill sound particularly compelling. Bernadette – I knew my visit here would threaten my budget ;-), but I’m glad I came. This is a fine set of summaries of some intriguing-sounding books. I want that Howell and that Owen, especially. Thanks – I think ;-).